Selected for Who's Who in America (2004) as a writer and educator, Vicki Hinze is also the award-winning author of fourteen novels, a nonfiction book, and hundreds of articles. She's been twice nominated for the prestigious RT Reviewer's Choice, Career Achievement Award for Best Suspense Novelist of the Year (2001) and Best Series Storyteller of the Year (2002). Vicki lives in Florida with her husband. "In LADY JUSTICE, Vicki Hinze has written a taut, twisty thriller about deadly, greedy evil and the strong and courageous men and women who fight it. I promise you, you won't soon forget Gabby, Max -- or the Ladies of Carnel Cove." 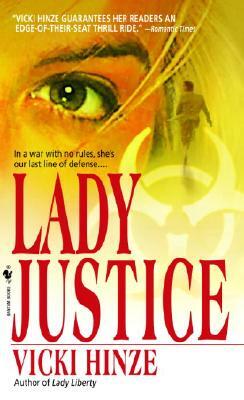 "Tense and top-notch, LADY JUSTICE will keep you anxiously turning the pages. Vicki Hinze writes about a world of dangerous men and women -- and she does it with absolutely convincing authority."